Picasso’s Vollard Suite, named for the art dealer Ambroise Vollard who commissioned the prints from Picasso in 1933, explores the theme of the sculptor’s studio and was an expression of his neoclassical style. The Suite was very popular and became Picasso’s most highly reproduced series. Unfortunately there are many examples of these reproduction lithographs in the market; therefore, we cautiously approached the information provided. We know the Vollard Suite consisted of 100 images, or plates, each printed in an edition of 313, meaning the edition size for the Vollard Suite originals was 313 and not 340 as the original appraisal suggested for the subject print. The subject Jeune Sculpteur Finissant un Platre (Young Sculptor at Work Finishing a Plaster) print is Bloch 156 in Picasso’s catalog raisonne from the Vollard Suite. In addition to the 313 etchings printed from each of the 100 plates in the Vollard Suite, there were 260 copies printed on Montval paper watermarked either “Picasso” or “Vollard”. There were also 50 copies printed on a Montval paper about 2″ larger in both directions and those were watermarked “Papeterie Montgolfier à Montval”. Finally, there were an additional three signed copies on parchment, rarities in the marketplace. Since the original Picasso etchings in the Vollard series of 313 all have watermarks, there was no mention of such in the previous appraisal. Because the subject property piece had the edition number of 186 out of 340 (vs. a 313 series ), we contacted the insured/owner of the piece for additional information. We hoped the previous appraiser neglected to mention existing watermarks on the work and that the out of sequence edition number was misread. We did ask the owner to check the edition number and we coached them as to how to look for the watermark, but unfortunately, the owner replied he did not see a watermark and the out of sequence numbering 186/340 was indeed recorded accurately. The owner explained the print was purchased at an estate/garage sale and the family was hopeful they had discovered an important print. In order to examine the print more thoroughly, we needed photographs. Accordingly, we contacted the previous appraiser who valued the piece for $12,000.00 and he sent us photographs of the subject property print from his files. Upon examining the photographs, it did not appear there was a plate mark impression on the print, indicating it may not be an original etching. When an etching is pressed against the plate to make the impression on paper, the outer square of the etching leaves an indentation around the image site. Also, we noted green and yellow coloring on the print (in the vines on the sculptor’s head) which we know was not in the original Vollard editions, as they were all devoid of color. It is our opinion that the coloring was added by a lithographic stone which was created from the original etching after Picasso’s time. 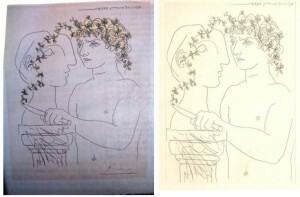 Given the lack of a watermark identifying the subject property print as part of the original 313 prints in the series, the incorrect edition number of 186/340, the lack of a plate mark, and the addition of color, we determined the subject print was an “after” Picasso reproduction lithograph. While the original etchings in the Vollard Suite have current replacement values of $12,000.00-$22,000.00 which parallel the previous appraised value and insured’s stated value of $12,000.00, it is not an accurate market assessment for a reproduction print outside of the original series. As mentioned, the Vollard Suite is Picasso’s most highly reproduced series and unfortunately there are many examples of these “after” lithographs in the market. Collectors and experts for these prints know what to look for when trading these pieces in the market and the property print that was appraised did not meet the standards of an original Vollard Suite etching. Based on our consultation with experts on Picasso etchings, our review of Picasso’s catalog raisonne, and our knowledge of Picasso’s prints, particularly the Vollard Suite, it was our opinion that the reproduction print had a replacement value no greater than $100.00. It is unfortunate that not all appraisers take the same measures when valuing a property, which is why we always suggest getting a second expert opinion when accepting an appraisal for a claimed value on a work of high end art. In the end, our expert research saved the insurance company $11,900.00, though the owners were left with a much lower value print. This entry was posted in Valuable Articles & Collectibles and tagged Ambroise Vollard, Enservio, Enservio Select, Etching, Pablo Picasso, Vollard Suite. Bookmark the permalink.